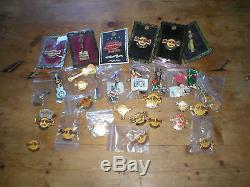 33 Hard Rock café badges from all over the world. Mainly from late 1990s to around 2011/12. The top six'framed' on the picture are from Venice, Rome, Memphis, Nashville, Philadelphia and New York. The ones still in their original wrappers are from Sharm El Sheikh, Buenos Aires x 2, Moscow, Orlando, Berlin, Singapore, Gothenburg, Koln, Dubai x 2, Philadelphia, Tokyo & Osaka while the badges without any wrappers are from Melbourne, Madrid, Lisbon, Amsterdam, Copenhagen, Sydney, Boston, Edinburgh, Barcelona, Chicago & Rome. All in very good condition. Please view my Feedback to see the level of service you can expect to receive from me.... The item "33 Hard Rock Cafe badges pins (inc Tokyo Osaka Koln Dubai Buenos Aires Rome)" is in sale since Tuesday, March 27, 2018. This item is in the category "Music\Music Memorabilia\Other Music Memorabilia". The seller is "hatfield68" and is located in HARROGATE, North Yorkshire. This item can be shipped worldwide.